Wedding is undoubtedly one of the most beautiful moments of a couple’s life. This auspicious event not only brings two souls together forever, but also brings them close to their family and friends who join them in the celebrations as a couple begins their new life together. The wishes and blessings of these people are very important for a couple’s smooth journey into this new phase of life. In an Indian wedding, all the rituals that are followed hold some cultural or religious significance for the bride and groom. The same goes for the chooda and kalire ceremony that is a part of a Punjabi wedding. These two ceremonies are specially held for the bride-to-be. Both these ceremonies are held one after the other on the morning of the wedding day, at the bride’s place. Read on to know the importance of the red and white chooda and the beautiful golden accessories that hang on them, famously known as kalire. Among the sweet and unforgettable memories of a Punjabi wedding, one ritual that holds a special position is the chooda ceremony. 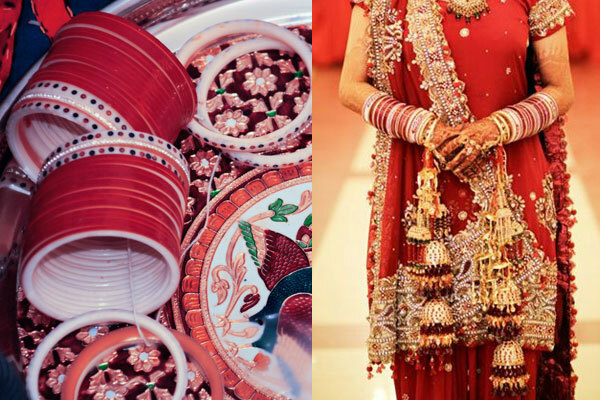 Traditionally, a set of 21 bangles in red/maroon and white/ivory is selected for this ceremony by the bride’s maternal uncle (mama) and aunt (mami). They gift the chooda to the bride during the ceremony. 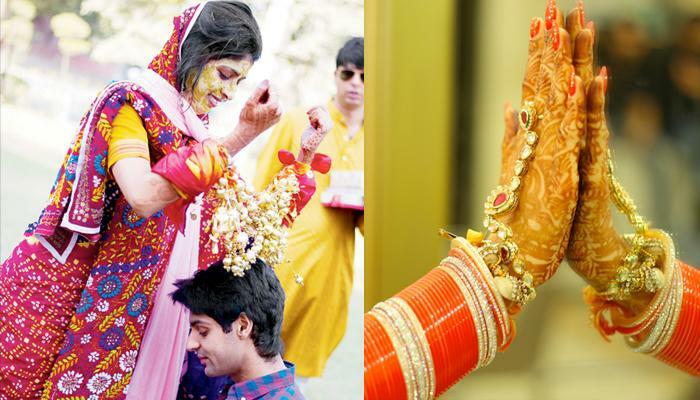 Nowadays, brides have started opting for different colour of bangles as well, like pink, purple, orange, and more. 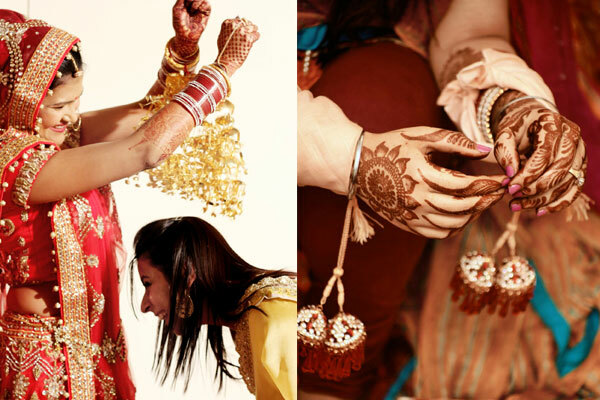 Also, the number of bangles vary depending on different communities and the bride’s personal preference. A puja or havan is usually organised during the chooda ceremony. The bangles are first purified with milk and rose petals. Before it is put on the bride’s wrist by her maternal uncle, all the close relatives touch the chooda as a mark of their blessings. After that, the wrist is covered with a white cloth, as the bride cannot see the chooda till the time of the wedding ceremonies. Chooda is an important part of a Punjabi bride’s solah shringar. This is one of the most evident marks of a new bride. Not only that, it is also known to bring good luck for the newlyweds. Also, red is a very important colour for a married woman as it is believed to strengthen the bond between a couple. Fertility and prosperity are two words that can be easily associated with the chooda, which is worn for a minimum period of 40-45 days after the wedding day. The chooda is accompanied with the bridal lehenga, which in many communities is gifted by the maternal uncle as well. Chooda ceremony is a Punjabi ritual but the same can vary in names for different cultures around the country. These umbrella-shaped hangings are a unique combination with the chooda, which signifies happiness for the newlyweds and eternal love between the couple. The bride’s sisters and friends tie the kalire to her chooda. They are golden or silver in colour. The significance is to provide good wishes to the bride and to remind her of her cousins and friends whom she is going to leave behind when she gets married. Also, the coconut-shape of the kalire is symbolic that she never runs out of food in the new home, while the metal symbolises wealth and prosperity. Often there are dried beetle nuts, dry fruits and coconut encrusted on the kalire. These are available in various designs and sizes, and one can pick according to their choice. The ritual is followed with the bride shaking her chooda and kalire worn hands on the heads of all the unmarried girls present. It is believed that if any part or leaf of the kalire falls on the head of any girl’s head, she will be the next one to get married. The next day after the wedding, one of the kalire is left at the temple with the priest for blessings and the rest are kept by the bride as a memory of her parent’s home and a momento of the wedding day.